Books have been written about the subject of where is the best place to ambush a big buck… I know I wrote 2 myself. The following article is actually a Partial chapter from my book The Whitetail Hunter’s Blueprint . Using Topo Maps, aerial photos and satellite programming on the internet in conjunction with a GPS is one of my most useful tools in deciphering where I should begin my scouting. I use this info for the framework of what, how and where I will begin my ground work. Let’s discuss the differences and benefits to the most common landscape features. Inside corners: I’m sure by now you have all heard at one time or another to hunt inside corners. Take a look at figure #6 is an example of an inside corner on an aerial photo. By far one of my favorite stand sites in agricultural type settings. Deer will often use these corners as a travel route because it is the shortest distance between two points and they are lazy. I want you to go to a park or a place that has high people traffic where one sidewalk meets another at a 90 degree angle, tell me if you can tell that lazy people cut that corner instead of following the sidewalk see fig #7 Well deer do the same thing. Also I have found through personal experience as well as the experiences of my peers that deer often enter into fields via inside corners because it allows them to see a larger portion of the field while staying in cover. Moreover there are often the spoils of agriculture left in tight corners that large combines or machinery cannot get to easily so it is left and becomes a mini food plot. Fence lines: Fences are found almost anywhere even out west in wilderness areas there are often fence lines that where created for open range cattle control or markers of boundaries. We humans love our fences. However they are not always depicted on maps or photo especially those within timber. Careful examination of photos is the best chance at locating one of these “Buck Factories”. To continue with the above an inside corner that has intersecting fence lines will often create a crossing point for deer. You can help this along by creating one by cinching the top and bottom wire together (see the tips section of my book to find out how). This crossing point further pin points where a hunter could hang a stand. You will often find several trails leading to the crossing point. This is obviously a good sign, a single trail may need further investigation. Often the trails converge well before the fence line and this converging trail may be a good stand site as well. Careful investigation with the use of trail cams will give you the info you need to decide. But for the most part I would stay on the fence crossing because it give you the opportunity to harvest a field edge buck. This is a buck traveling along the edge of the wood lot basically walking the perimeter of the field and the wind may be a little easier to play with only one trail to watch. Fence lines in general are often very productive as I mentioned earlier, deer encounter a fence at some point in their travels and will then often follow along the fence until they come to an easy place to cross (again deer are lazy) When I hunt out west or in big timber fence lines will often produce great stand locations at these crossing points. If you add other structural features in conjunction with fence line like: benches, saddles, river bottoms and/or funnels, they become even more productive. A fence that separates bedding from feeding areas will often have heavy traffic at low points and breaks in the fence. In arid regions, water holes sometimes have fences around them low points or breaks here are definite stand locations. Let me clarify something when I say “stand” I don’t only mean tree-stand, I mean blind or posting spot. A stand to me is a place where I post and wait for animals to come to me. Funnels: Another really productive stand site is a funnel. 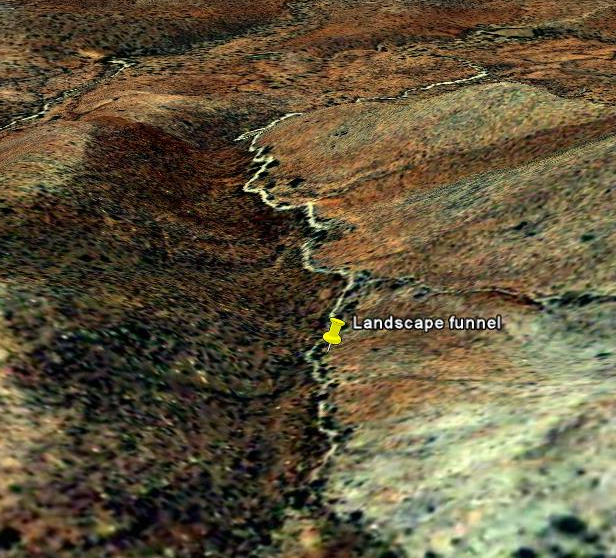 Now there are many different landscape features that can be considered a funnel. I will touch on the three most common. Wood lot funnel: see fig #9 This is a strip of cover 10 yard wide to 100 yards wide that connects to large wood lots. Deer crossing from one lot to the next get “funneled” into this narrow strip giving us an interception point. Landscape Funnel: see figure #10 This is where a wash or topography creates a physical funnel that deer will use because it easier walking to the top of a hill or up to a desired point. Hill top fields or pastures often have this characteristic leading up from a creek bottom or lowland wood lot below. A field Funnel: this is better described as a peninsula of trees jutting out into a field that deer would feed in see fig #11. Deer will often enter fields through these funnels so they can investigate from cover a long as possible. Also to minimize the time spent out in the open they will use these peninsulas to cross the field because it is the shortest point between cover. Investigation of these areas will more often than not produce favorable sign. And a good stand site. Saddles: Saddles also play into the lazy deer theory; these are low points in ridgelines that offer the easiest place for a deer to cross from one side of a ridge or mountain to another. In really hilly terrain these are very good interception points there are often several trails that converge into one trail to cross over the saddle. See fig #12 for an example of a saddle. Wind plays an important role here because the wind will often be multidirectional meaning it may be blowing from north to south but will often create a swirling effect and carry your scent back the way the wind was coming from. This is evident in many hill top set ups. I for one don’t pay a whole lot of attention to the wind, and people call me foolish for this but it’s not my main priority because I take painstaking detail into my scent eliminating regiment. Plus I often set my stand in a spot that if the wind changes I still have opportunities to harvest a buck. I am not by any means saying don’t play the wind if I didn’t think the wind was important I would not have included a section on it in my book. But what I am saying is the wind is unpredictable so be detailed in staying scent free and chose your set ups that if the wind changes you’re not S.O.L. Benches: a Bench is a relatively flat spot on the side of a mountain or ridge that runs parallel to the ridge itself, creating and easy walking path for our lazy deer and often a bedding area if the ridge over looks more open terrain. I personally do not like hunting benches themselves but I do like to locate them and follow their trails back to cover or to feeding areas. As I mentioned earlier the bench trails may also lead up to the converging ridgeline trail and saddle trail. Edges : These are the big woods hot spots, there are many different types of edges by definition they are where one type of terrain meets another. Example wooded area meets a swamp or a burn meets timber and lastly clear cuts. Before man started altering the whitetails landscape, Mother Nature created edges and breaks with fire, wind and water. It is these breaks where the best food sources for wild deer. Deer did not have what has now become a “natural” food source for them, our agriculture. Well in areas void of agriculture and excessive human involvement, it is these same areas that deer rely on for food and cover. Living in the western United States for my whole adult life, it was an adjustment to learn how to locate deer in timber and areas otherwise void of agriculture. Coming from the east where we hunted mostly farm land and hunted areas that had 30-40 deer per sq mile to moving to the west where we have 10 deer or less per sq mile. Needless to say it was a whole new world. I learned to glass and stalk for deer instead of intercept deer. Through my experiences during my glassing and stalking days, I realized that I would almost always find deer on the edges of 2-3 year old burns, logging clear cuts, riparian areas, in areas where ponderosa pine transitioned to oak scrub or juniper stands. Which got me to investigate those areas more closely. I began looking for ways that I could intercept these seemingly “patternless” deer. I would sit and watch deer for weeks leading up to hunting season to get an informed idea where I could set up a blind or stand. Now not all of us have weeks to spend watching deer movements, thank god for the invention of trail cameras. Needless to say, when hunting the big woods, edges or breaks can be just as good as hunting a food plot, if you choose the right one. Burns and clear cuts about 2 years old till about 5 years depending on rainfall and winds are usually very good places to begin looking for sign. Riparian areas will almost always have game sign because of the constant new growth and water. Swamp edges especially when there is a large break in the tree canopy always produce recluse bucks. Now that you are armed with the info you need to build your game plan, hit the field and scout these areas there is no substitute for boots on the ground. Try to stack as many terrain features you can in your favor, hang some cameras, choose a tree and send Earned a pic of your buck……..